Split, being a seaside city, offers a lot of fun stuff to do out at the sea. There are boat excursions, adventure & adrenaline activities and rent-a-boat services. We’ll try to get them all in our blog series, for you to find them easier than going through the internet. We’ll start with boat Day trips from Split. Keep in mind we are not presenting just our tours, operated by us, but our competitiors’ too. Furthermore, we’ll list every major tour operator doing particular tour or activity. So, this is not about us, it’s about you being able to find your ideal boat tours in Split or any kind of sea related activity. 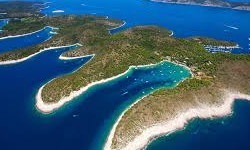 * In addition, the list of boat tours from Split is organized by the “duration of the tour” criteria. Tours operating: daily, between 01.06.-30.09.
one of the best selling boat day trips from Split is a cruise to the Blue Lagoon, a bay on the island of Drvenik Veli for a delicious wood-grilled fish lunch, with great local wine. Plenty of time to swim, snorkel, trek, relax, explore! After lunch, it will take you to Maslinica, island Solta. Maslinica is the perfect location for swimming and hanging out with the locals. Pros: Bigger boats, cheaper than the Blue cave tour, Šolta island (Maslenica) is amazing! Tours operating: Tuesday, Thursday, Sunday, between 01.06.-30.09. Enjoy the relaxing journey, visit beautiful islands of Brač and Šolta, swim in the secluded cove in the crystal-clear Adriatic Sea, discover the picturesque town of Stomorska where after the lunch you can walk the charming village or take a swim at the local beach. Tours operating: Monday, Wednesday, Friday, between 01.06.-30.09. Visit the most popular Croatian beach and enjoy sailing in a relaxing atmosphere while cruising along the Adriatic islands. Feel the charm of Dalmatian small town of Bol, beautiful streets, memorable pathway “Šetnica” leading you to the “Golden horn” (on Croatian “Zlatni rat”) beach … Enjoy swimming on this unique beach Enjoy cruising along the coast of the amazing island of Brač, passing through the “Door of Split”, the channel between islands Šolta and Brač. Pros: Biggest boat in Split, cheaper than the Blue cave tour, nice atmosphere, the only boat doing this tour. Visit the most popular Croatian island town of Hvar, and adjacent archipelago Paklinski islands. You’d have enough free time at each destination due to the fact it is a speedboat tour (boats similar to Zodiac) which saves time on traveling, letting you enjoy Hvar for sightseeing and other locations (one more is added, Brač island bay fisherman village Milna) for swimming and snorkeling. Tours operating: daily, between 01.05.-30.09. 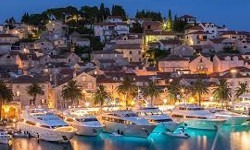 Speedboat tour, visiting usually 5 destinations, including Hvar town and the Blue cave Croatia. Boat types are different, going from RHIBs to aluminum yachts, from 10 to 18 passengers. Almost everything is known about this tour, in a nutshell, so we’ll just say it’s a must= one of the most sought after boat day trips from Split, even in the entire Dalmatia. – Blue cave travel, Portal, Toto travel, Waterworld Croatia, Tour Split, Split trips, Sail To. Relaxing and refreshing 3 hours out on beautiful coastal Croatia. During the boat ride, you can enjoy the panoramic views of Split and its surroundings. After 30 minutes drive in our speedboat, you arrive far away from the city crowds and mainstream tourism, that is, at stunning Blue Lagoon in Croatia. You can spend your time swimming or snorkeling on small, hidden, untouched beaches, and be taking amazing pictures. After this beautiful and relaxing day on the sea, take in last views of the Adriatic and its Islands while returning to Split. Tours operating: daily, between 01.04.-30.10. Missing to explore the sea and islands surrounding the beautiful city of Split while staying on your vacation in this Dalmatian center is probably the biggest mistake you can make. So, to correct this mistake we decided to offer to you the opportunity for one-day sailing trips from Split to the island of Šolta. We realize that you have many activities on your mind while visiting Split so this one day trip is the perfect choice to explore the whole area around Split while staying here on your vacation. Tours operating: daily, between 01.04.-31.10. This unique vessel offers a pleasant and safe tour and is ideal for adults and children of all ages. It remains above sea level at all times, while its hull, the underwater observatory, is 1.5 meters (5 feet) below the surface. Through your own personal viewing window, you can watch the abundance of marine life. You can leave the cabin and walk on the deck at any time, you can also enjoy the spectacular view of the historical complex of Split with the Palace of Diocletian. You can choose between day tours and night tours with underwater lights. Tours operating: daily, between 01.05.-31.10. Swimming and sunbathing on the island of Čiovo. A 3 hours long getaway from the city noise and heat. Split is also home to one of Europe’s most beautiful Old Towns, built into the alleys of the 1,600-year-old Diocletian’s Palace. Strolling around this part of the city is an essential activity for anyone visiting Split. However, if you’re also interested in delving under the surface of the city, there are also a wide number of slightly more unorthodox things to see and do here. We’ve picked out 12 of the best.